One of the biggest and most exciting days for our kids this summer was the day we built our new swing set. 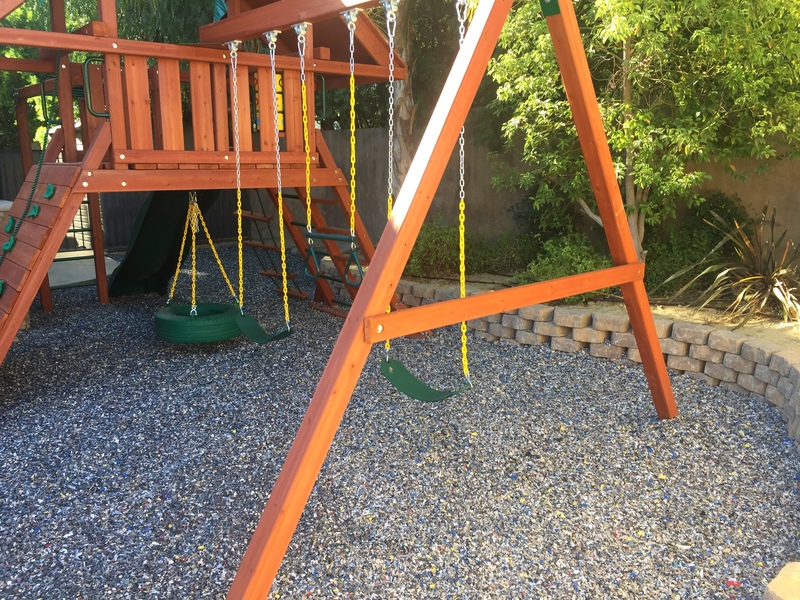 Since they’re older (almost five and three), we wanted a swing set that could grow with them for the next several years. Choosing a new swing set was relatively easy considering we knew what we wanted. The hard part? Choosing a surface to go under the new swing set. 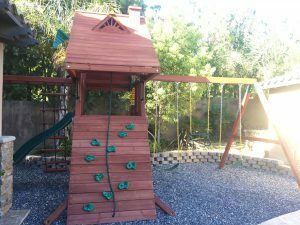 There are several playgrounds in our area with a wide range of surfaces. My least favorites include: sand (mostly because they serve as raccoons, cats and other animals litter box…I will take a pass on the parasitic germs! 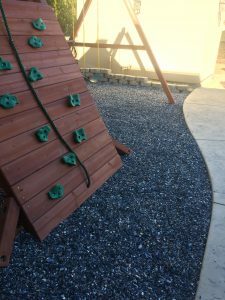 ), pea gravel (as my youngest likes to throw it and they both constantly complain about getting the pebbles in their shoes), and wood chips (for no other reason than I simply don’t prefer wood chips as a play surface). My favorite used to be rubber-based surfaces. However, after learning about the increasing concerns of the toxic chemicals emitted from both recycled tire rubber surfaces and new rubber/synthetic material surfaces, I knew I needed another option. Thankfully, I came across Jelly Bean Rubber Mulch. 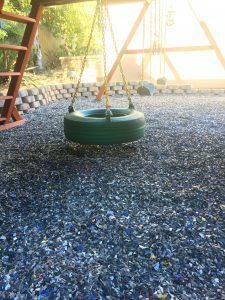 It is the only 100% non-tire rubber mulch on the market made from non-toxic, latex-free rubber tiles. Thus, there are zero toxic chemicals or VOCs my children are inhaling during playtime. 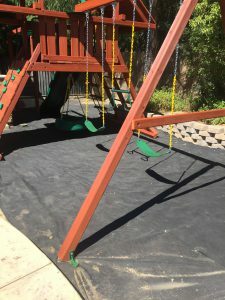 Moreover, there is no color leaching as it contains the natural color of the rubber, and it has the best test data in the industry to show it’s the safest playground rubber mulch for falls. In addition, the durability and warranty is better than any other surface option. As for installation, we simply dug 4-inches down and leveled. We applied a mesh fabric on top of the dirt, and poured the rubber mulch via wheel barrel to fill the space with a 3-4 inch depth. It was fairly simple. The jelly bean mulch pieces are slightly smaller than I expected, but so far, we are incredibly happy with it. Though it may not be the most esthetically-pleasing option (although I much prefer the look of this over wood chips or sand), the most important thing to me is ensuring a safe and non-toxic play environment for my kids. My wish is that more schools, churches, and parks remove their toxic rubber surfaces and replace with non-toxic options!